Washington has tried its very best to sweep the war in Afghanistan under the rug. Most of the press dutifully went along with the fiction of declaring the war to have ended in December. The military joined in, trying to classify virtually all information coming out of Afghanistan. That classification move has been backtracked somewhat, but we still haven’t seen a revised quarterly report from SIGAR with the newly released data. The figures from this report include only a subset of the types of death tracked by UN, accounting for the slight discrepancy in the years of overlapping data. US military operations and continued presence in Afghanistan has been a disaster for civilians there. The insurgency which has arisen in response to the US presence is responsible for most of the casualties, but it is hard to see how these numbers would be as high if the US had simply left after deposing the Taliban in the first few weeks of the operation. For example, on 11 July, an ALP member shot and killed a local shopkeeper after an argument over ice. On 7 July, an ALP commander and four of his men assaulted (and injured) four civilians in Jorum district, Badakhshan province, during a wedding party. The reason for the beating was reportedly that the family had failed to provide food to the ALP as demanded. UNAMA documented multiple examples of ALP intimidating and ordering the displacement of families from their communities. For example, on 12 October, ALP forcibly displaced 150-200 families from Khak-e-Safed district, Farah province. The ALP had warned the local population not to allow the Taliban to launch attacks from the village. 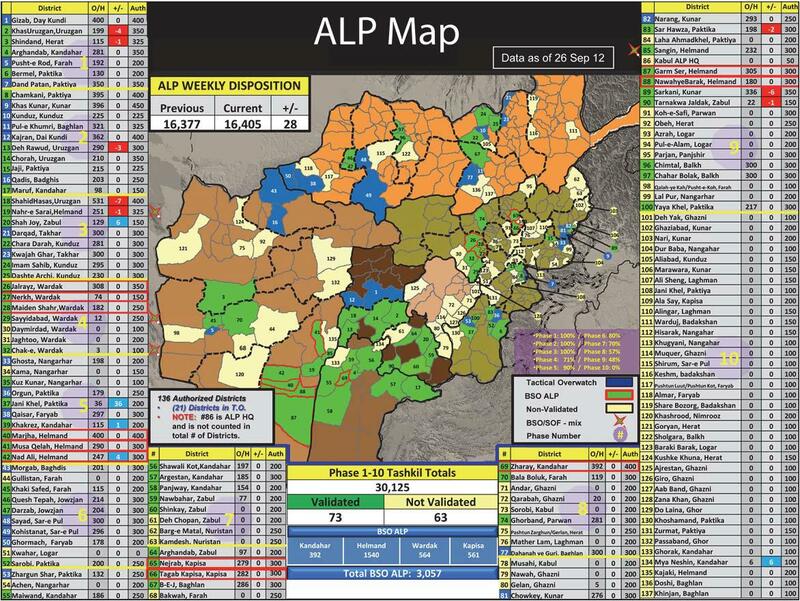 The Taliban had also threatened the local population not to cooperate with the ALP. After Taliban fighters established positions in the area, the ALP ordered the 150-200 families to leave the area, resulting in displacement of an entire village, mainly to Farah city. I would imagine that someone in Washington is busy today trying to find a way to prevent UNAMA from releasing its next report. The CIA is dismantling its frontline Afghan counterterrorist forces in south and east Afghanistan leaving a security vacuum that U.S. commanders fear the Taliban and al-Qaeda will fill—and leaving the Pakistan border open to a possible deluge of fighters and weapons. U.S. and Afghan military commanders tell The Daily Beast that Afghan forces are stretched too thin to replace many of those departing CIA paramilitaries. Thousands more CIA-trained operatives are about to get the boot ahead of what already promises to be a bloody summer fighting season. That could mean spectacular attacks against U.S. and Afghan targets just as the White House is weighing its long-term commitment to Afghanistan. And it could give the now-small al-Qaeda movement inside the country more freedom to grow and eventually hatch new plots more than a decade after the invasion meant to wipe out the perpetrators of the Sept. 11th attacks. The forces now facing the chopping block are 750 members of the Counterterrorist Pursuit Teams in the Kunar region — home to the elusive Afghan al-Qaeda leader Farouq al-Qahtani al-Qatari — and the entire 3,500-strong Khost Protection Force. Completely missing from the article is any mention of another network of small militias that also operate within Afghanistan with CIA and/or JSOC handlers “advising” them: the Afghan Local Police. I had already noted over a year ago that with the impending pullout of US troops, control of these death squads would transition exclusively to the CIA (note Dozier’s statement that the CIA is not affected by the Bilateral Security Agreement–meaning that they have no intention of leaving even if the military is forced into the “zero option”), even as they are forced to withdraw to fewer bases. Highlighting on the importance of support from the international community post-2014, the Ministry of Defense (MoD) requested the international community to continue assisting the Afghan forces by providing equipment and proper training post-2014. The battle of Afghanistan against terrorism has seen some big sacrifices in terms of military and civilian casualties. Over the past 12 years, since the beginning of the Afghan war, over 3,000 foreign soldiers and over 10,000 Afghan soldiers have lost their lives. The foreign forces’ combat mission is scheduled to end in the next few months, but a greater question looms large with regard to how effective has the fight against terrorism been over the past 12 years? In light of this, Bismillah Mohammadi, the Minister of Defence expressed concerns over the training and equipping of the Afghan Security Forces post-2014. Mr. Mohammadi urged the international community to continue assisting the Afghan forces beyond 2014. “We urge the international community to equip and train the Afghan Security Forces post- 2014,” said Mr. Mohammadi. “Three International Security Assistance Force (ISAF) service members died when an individual wearing an Afghan National Security Forces uniform shot them in eastern Afghanistan today,” a statement from the coalition said. A US defence official confirmed to AFP that the three victims were from the United States. An Afghan official, speaking on condition of anonymity, told AFP that the attack happened during a training session in the insurgency-hit province of Paktia. The Afghan soldier opened fire on US soldiers, killing two on the spot, he said. A third later died of his wounds. The attacker was killed when Americans and Afghan soldiers returned fire. There have been seven “insider attacks” this year against coalition forces, compared with 48 in 2012. ISAF officials say the decline has been due to better vetting, counter-intelligence and cultural awareness. Foreign soldiers working with Afghan forces are regularly watched over by so-called “guardian angel” troops to provide protection from their supposed allies. The military really wants us to believe that they have finally learned cultural awareness and that they have put into place appropriate screening and counterintelligence processes that will eliminate threats. And those programs are working so well that the military now assigns soldiers to act as armed guards during training sessions. Seventeen-year-old Chaman Gul suffered a similar fate to that of Monizha. Relatives describe her as being a “healthy and attractive” young woman. In a phone interview with Newsweek/The Daily Beast, she described the ordeal she suffered two months ago in Aqsaee village, Darzab district, in the northern province of Jowzjan. As she, her relatives and other villagers tell it, she was brutally raped by seven men, including the local militia’s powerful commander, Murad Bai. “They broke down the door of our home and did to me, a number of times, horrible things that I can’t tell anyone or put into plain words,” she says from an undisclosed hiding place. Rather than quietly hiding her suffering, as most victims and their families do, Gul took her case to the district and provincial authorities—but to no avail. “I complained to everyone in the concerned departments, but no one heard my voice,” she says. And that is the key to how these atrocities are carried out. The heads of the militias, whether they are officially within the Afghan Local Police, or supposedly unsanctioned, but wearing ALP uniforms (and I suspect in that case, these groups are more likely to be CIA-affiliated “A-teams” like the one headed by Zakarai Kandahari in my post from Tuesday), are working with the blessings of, and under the protection of, the US. The groups know that they will not be held accountable for anything they do and this unlimited power can lead to the atrocities that we have seen. When last we left the saga of the US role relating to the “rogue” Afghan death squad in the Nerkh District of Maidan Wardak province of Afghanistan, the New York Times was studiously transcribing denials from various US government officials of any US involvement in the torture, disappearances and murders that are both the touchstone of US-trained death squad operations dating back at least to Central America in the 1980’s (if not all the way back to Vietnam) and the atrocities that prompted Hamid Karzai to announce that he was expelling US Special Forces from the province. Although Karzai eventually relented somewhat and agreed to only expel US Special Forces from the Nerkh District instead of the entire province, as I pointed out in my post on the Times’ transcription of US denials, evidence continues to accumulate that CIA paramilitary operations personnel almost certainly seem to have been involved in the training and deployment of the “rogue” Afghan Local Police unit based in Nerkh. With today’s new development, it seems very likely that these CIA paramilitary personnel (and their Afghan trainees) are still operating, with impunity, at the Nerkh base. Family members on Tuesday found the body of a man missing since last November near the American Special Forces base to which he was last seen being taken, according to Afghan officials and victims’ representatives. Afghan investigators said that after his disappearance, the man, Sayid Mohammad, was seen in a video undergoing torture at the hands of an Afghan-American named Zakaria Kandahari, who was the chief translator for an American Army Special Forces A Team stationed at the base in the Nerkh district of Wardak Province. Mr. Mohammad’s body was found about 200 yards outside the perimeter of the Nerkh base, which is now occupied by Afghan special forces after the American unit was removed following protests by Afghan officials, including President Hamid Karzai. Relatives of Mr. Mohammad said his body was largely intact but both of his feet had been cut off. They took his remains to the Nerkh district government center in protest. The partial remains of another missing person were also found near the base, family members and Afghan officials have said. The article is silent on the question of how long the victim appeared to have been dead. Note that the Times reminds us that the Nerkh base no longer has US Special Operations Forces. I find it very hard to believe that a group of Afghan Local Police and Afghan Special Forces, after having drawn so much local anger and international attention to themselves through prompting Karzai’s outburst and expulsion of US Special Forces, would carry out such a brazen and brutal move on their own. However, if CIA paramilitary operatives are still present at the base and still directing (and protecting) the Afghan team, the move seems less surprising. The description of the videotape of the torture session conducted by Kandahari (which still has not been released) has changed in one respect. Today’s article informs us that the Afghan investigator who was interviewed now says there were no voices with American accents on the tape. Not that it really needs pointing out, but involvement of CIA paramilitary personnel at the Nerkh base would by definition be a covert mission covered by false, but official US government denials. Oh, and there’s one last question I would have added to the Afghan investigator’s list above: Who helped Zakaria Kandahari to escape without a trace? The answers to those questions would go a long way toward confirming or denying my speculation on CIA paramilitary personnel (including contractors) being central to these awful events. NATO is claiming that there now is an agreement with Afghan President Hamid Karzai regarding the withdrawal of US Special Operations Forces from Maidan Wardak province in the wake of Karzai’s insistence last month that the troops leave immediately. Despite the presence of an agreement, however, there appear to be many different explanations for just what the agreement means for how long US SOF will be present in the province. Given the history of the US bargaining with Afghanistan in bad faith (see, for example, this post on the Parwan Prison handover and work backwards in time through the links and this post for a description of US reliance on semantics in making these sham agreements), it is not at all surprising to me that these initial reports on the agreement would cite a lack of specificity and that different news organizations would come up with widely differing descriptions of its expected effects. Afghan President Hamid Karzai and NATO-led forces have reached an agreement on the departure of foreign troops from a strategically key province near the capital, coalition forces said, but it was unclear if U.S. special forces would leave. An Afghan defense ministry spokesman told reporters in Kabul that the elite American force would quit Wardak within a few days, despite earlier U.S. concerns that their departure would leave a security vacuum. The NATO-led International Security Assistance Force (ISAF) in Afghanistan said in a statement Afghan security forces would take over security from coalition forces in Wardak, but did specifically mention the withdrawal of U.S. special forces. Note that Reuters knows that ISAF statements must be parsed carefully and they do a good job here of warning us that ISAF did not state outright that US SOF would leave the province. The U.S. military and the Afghan government reached a deal Wednesday on a gradual pullout of American special forces and their Afghan counterparts from a contentious eastern province, officials said. President Hamid Karzai has blamed the troops for egregious human rights abuses in Wardak province, allegations which U.S. military officials have steadfastly denied. However, NATO forces said in a statement that commander Gen. Joseph Dunford agreed with Karzai to remove American troops first from Wardak’s Nerkh district and then later from other parts of the province. Afghan Defense Ministry spokesman Gen. Zahir Azimi confirmed there has been a deal in a news conference in Kabul on Wednesday. “The international forces are ready to withdraw the special forces from Nirkh district of Maidan Wardak province and Afghan army units are going to replace them in the coming days,” Azimi said, adding that there are no other U.S. commando units in the rest of the province. A U.S. military official explained that a small, mostly U.S. army special operations team would withdraw from Nerkh, as would the Afghan local police force that works alongside the Americans. Azimi states outright that the only US Special Operations Forces in Wardak are in the Nerkh district and that these will be withdrawn. Dozier misses the point that Reuters parsed out, namely, that it appears that ISAF speaks of US forces withdrawing from the province while being silent on whether SOF also would withdraw. The CIA is expected to maintain a large clandestine presence in Iraq and Afghanistan long after the departure of conventional U.S. troops as part of a plan by the Obama administration to rely on a combination of spies and Special Operations forces to protect U.S. interests in the two longtime war zones, U.S. officials said. The withdrawal of U.S. forces from Iraq in December has moved the CIA’s emphasis there toward more traditional espionage — monitoring developments in the increasingly antagonistic government, seeking to suppress al-Qaeda’s affiliate in the country and countering the influence of Iran. In Afghanistan, the CIA is expected to have a more aggressively operational role. U.S. officials said the agency’s paramilitary capabilities are seen as tools for keeping the Taliban off balance, protecting the government in Kabul and preserving access to Afghan airstrips that enable armed CIA drones to hunt al-Qaeda remnants in Pakistan. Note that bit about the US withdrawing all of its troops from Iraq in December of 2011. The full withdrawal of course wasn’t what the US intended, but was a result of the botched negotiations for a Status of Forces Agreement that would confer immunity to US troops who remained behind in Iraq after the official “withdrawal”. A significant portion of those troops that would have been left behind would have been Special Operations Forces to train and control counterinsurgency militia groups. We were reminded just last week that these groups in Iraq were responsible for so many atrocities that they became known as death squads. As I pointed out, Petraeus’ counterinsurgency program in Afghanistan was built in the same way. 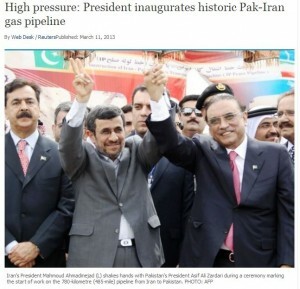 Headline and photo from Pakistan’s Express Tribune announcing the pipeline groundbreaking ceremony. The image could be an old one, since that is Pakistan’s former Prime Minister Yousaf Raza Gilani on the left. On Saturday, the ceremony to transfer final control of the Detention Facility in Parwan to Afghanistan was canceled at the last minute as the US once again tried to maintain veto power over Afghan decisions on which prisoners to free. This occurred amid a backdrop of a range of other events demonstrating how the US is trapped in a quagmire in Afghanistan and yesterday was no better, as Karzai ratcheted up his rhetoric even further, prompting cancellation of the joint press appearance featuring Karzai and Chuck Hagel, who was making his first trip to Afghanistan as the new US Secretary of Defense. The 1,600-kilometer pipeline, projected to cost USD 1.2-1.5 billion, would enable the export of 21.5 million cubic meters of Iranian natural gas to Pakistan on a daily basis. Iran has already constructed more than 900 kilometers of the pipeline on its soil. Tehran-based Tadbir Energy Development Group will reportedly undertake all engineering procurement and construction work for the first segment of the project, which starts from the Iran-Pakistan border and costs around USD 250 million. The Iranian firm will also carry out the second segment of the project, and extend the financing later to USD 500 million. The two sides hope the pipeline will be complete in time to start delivery of 21.5 million cubic metres of gas per day to Pakistan by December 2014. The US has issued warnings to invoke economic sanctions already in place against Iran if Pakistan went ahead with its plans to import natural gas from the Islamic republic. The United States has steadfastly opposed Pakistani and Indian involvement, saying the project could violate sanctions imposed on Iran over nuclear activities that Washington suspects are aimed at developing a weapons capability. Iran denies this. During the meeting at the international airport of the Southeastern Iranian port of Chabahar today, Ahmadinejad and Zardari said that the gas pipeline will further strengthen the economic, political and security relations between Tehran and Islamabad and other regional states. US presence in the region clearly has been a destabilizing force. Iran and Pakistan appear to be taking steps toward what they hope will be improved stability once we are gone. Yesterday, the Guardian published an article detailing how the US turned to the use of death squads in Iraq to quell the rise of Sunni militias. The article provides convincing evidence that this was an intentional policy and was in fact a central tenet of David Petraeus’ often-praised counterinsurgency, or COIN, strategy. The key person in the Guardian’s reporting is James Steele, who was a veteran in organizing Central American death squads on behalf of the US during the Reagan years. In reading the material from the Guardian, however, it should be kept in mind that Petraeus did not institute his COIN strategy only in Iraq. He put it into place in Afghanistan as well, and the fact that it lead to widespread allegations of torture and murder there demonstrates that the atrocities committed by these militias is a feature of the funding and training provided to them and not an unfortunate outgrowth, because this practice has now produced death squads in Central America, Iraq and Afghanistan. Recall that less than two weeks ago, Hamid Karzai called for the expulsion of US Special Operations forces from Maidan Wardak province due to allegations of abuse by the Afghan Local Police there. The Afghan Local Police are in reality groups of local militias trained and funded by US Special Operations forces and operating separately from the Karzai government. 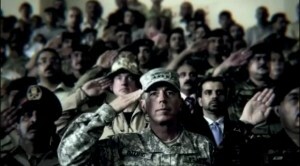 The ALP became one of the primary features of Petraeus’ COIN strategy when he moved it to Afghanistan. What to do about the deepening quagmire of Iraq? The Pentagon’s latest approach is being called “the Salvador option”–and the fact that it is being discussed at all is a measure of just how worried Donald Rumsfeld really is. “What everyone agrees is that we can’t just go on as we are,” one senior military officer told NEWSWEEK. “We have to find a way to take the offensive against the insurgents. Right now, we are playing defense. And we are losing.” Last November’s operation in Fallujah, most analysts agree, succeeded less in breaking “the back” of the insurgency–as Marine Gen. John Sattler optimistically declared at the time–than in spreading it out. The most disgusting aspect of this apparent “trial balloon” floated by the Bush administration is that the program quite possibly was already underway when the Newsweek article came out. The Guardian article reminds us that Petraeus, the architect of this program, was sent to Iraq in June of 2004 (this was his second deployment to Iraq) to begin training Iraqis, and the Newsweek article wasn’t published until January of 2005. Steele, who was reporting directly to Rumsfeld, first went to Iraq in 2003 (Rumsfeld delighted in running his own people separately from the chain of command; he did this at times with McChrystal as well). Detail from CIA map of Afghanistan. Click on map for a larger view. The Afghan Local Police program was a centerpiece of David Petraeus’ counterinsurgency (COIN) program in Afghanistan when he took over command after Stanley McChyrstal was fired. The program came under extreme scrutiny this week when Afghan President Hamid Karzai called for the expulsion of US Special Operations forces from the province of Maidan Wardak after repeated reports of atrocities carried out by forces claiming to be allied with ALP forces trained by SOF. Today, there is further bad news for the ALP program, as seventeen people have been killed at an ALP post in what appears to be an insider attack. Since the attack occurred early this morning, it should be kept in mind that information is still coming in regarding the details of what took place. Today’s attack was in Ghazni province, which is adjacent to Wardak, as seen in the map here. To mitigate the risk of insider threats, SOJTF-A has taken active measures to re-validate all 16,474 ALP personnel. This revalidation process is currently 52 percent complete, with less than one percent removed due to nefarious activities or counter-intelligence concerns. This process, which is currently ongoing, is very similar in design to our initial screening/validation methodology. It begins at the local level by conducting shuras and intimately involving local elders, who must vouch for each ALP member, ensuring he remains in good standing. Each member’s application paperwork is re-reviewed by various personnel from the Coalition, MoI, NDS, and the DCOPs. If any ALP member “flags” as suspicious, additional counter-intelligence (both Afghan and Coalition) measures are taken. If it is determined that an ALP member is unfit, he is removed from the program. These processes are non-negotiable. In addition, NDS plans to embed three agents per 100 ALP to identify possible infiltration by the enemy. The prevention/elimination of Insider Threats will remain COMISAF’s top force protection priorities. A group of 17 Afghan policemen were drugged by their comrades while on duty and then shot to death in their sleep in what appears to be the single worst incident in a string of similar attacks, according to Afghan officials. The attack took place at a remote Afghan Local Police post in Ghazni Province, south of the capital, early Wednesday morning, according to General Zrawar Zahid, the Ghazni police chief. Other Afghan officials said authorities had already arrested two policemen who they said were Taliban infiltrators who had carried out the attack. The dead included 10 members of the government-backed Afghan local police, and seven of their civilian friends, said Provincial Gov. Musa Khan Akbarzada. He says there was a conspiracy of some sort but declined to confirm if poison was involved.